We have divided the products below into what we would regard as legacy spare parts and current product still being used in building new machines. 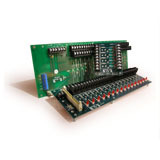 G1 or Classic Generation One digital and analog modules and backplanes and comms products. G4 - Generation 4 digital modules and backplanes. PCB mount both AC and DC SSRs- Solid State Relays. A Real Time multi tasking controller in a sowing machine stle box, with analog meter, button switches, LEDs and buzzer, plus temperture probe. A Real Time multi tasking controller in a training style box, with analog meter, button switches, LEDs and buzzer, plus temperture probe. A PC Based Virtual PLC multi tasking controller in a training style box,, with analog meter, button switches, LEDs and buzzer, plus temperture probe.